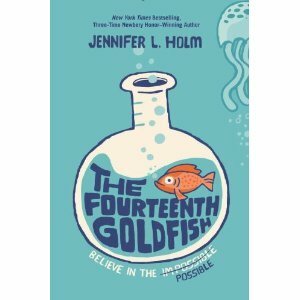 The Fourteenth Goldfish is the story of a girl named Ellie and her grandfather. Ellie lives with her mom, a nutty high school drama teacher, and is mourning the loss of her best friend to the volleyball team, as well as her goldfish. In the beginning, we learn her mother replaced the goldfish each time it died. The fourteenth goldfish is when the lesson is learned. Her moody grandfather comes to live with them after being arrested. The only thing is, he has been transformed from an old man into a teenage boy. As a scientist, he has invented something similar to a fountain of youth, and tested it on himself. Ellie has to help her grandfather adjust to being a teenager again, while dealing with being without her best friend. She also learns some science along the way, which sparks her interest in famous scientists like Marie Curie and Jonas Salk. It seems that in the end, each character learns a lesson about life and grows a little as a person. What I liked about this book is that it piqued my interest in famous scientists. It snuck science education into a cute, feel-good story about a girl and her grandfather, almost tricking a student to learn, which is my favorite thing about good literature. Aside from rich characters, of course. This story doesn’t stand out as having rich, well-developed characters, but that’s not to say they aren’t sufficiently developed. Ellie walks the line between science (her grandfather) and fantasy (her mother), and finds a healthy mix of both. What I didn’t like about this book is that it wasn’t challenging reading. Or maybe that’s what I did like, because some of my lower readers will still enjoy a fourth grade reading level book while learning science at the same time. The cover is quite attractive, and it has the tagline “Believe in the impossible possible,” making me think there was more to it, but there really wasn’t. It was a cute story, but not too deep. I would recommend this book to someone who didn’t like Tuck Everlasting but is interested in the pros and cons of eternal youth.